The new hip thing today is these Internet of Things devices, right? 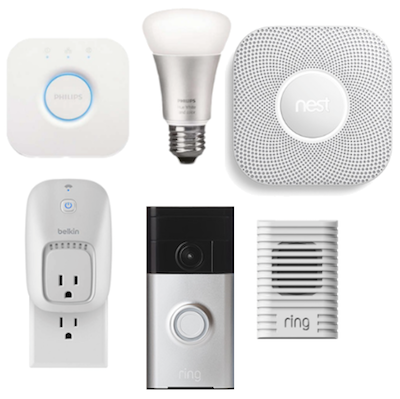 Steve and I have been dipping our toes in with the Ring video doorbell, the Chimes that go with it, the Hue Lights that automatically change in time with The Expanse series on SyFy, the Nest Protect smoke alarm that’ll tell us if there’s a fire even if we’re not home, and the Wemo Switches that turn on our hot water pump so we have toasty hot water when we need it. But they all rely on one really important thing. They need to be able to connect to the our home WiFi network to do their various duties. A while ago we had a little power blip, nothing major, over in a minute or two. It knocked all of the devices off line. Some of them came back by themselves, but some of them didn’t. The Ring Chimes seemed particularly difficult to get back onto our network. Remember, everything is fiddly, right?Steve and I (ok, mostly Steve) spent hours trying to get the devices reconnected, and for a time, they’d reconnect for a while then disconnect, again and again. We chased this problem for weeks. We really started buckling down on trying to find the root cause this week. As we noodled the problem over dinner, while driving to the gym, while walking to the beach, we thought about the one thing these devices had in common, and that’s that they all connect over the 2.4GHz network. We also thought about the fact that NONE of our 5GHz-capable devices were having network issues. 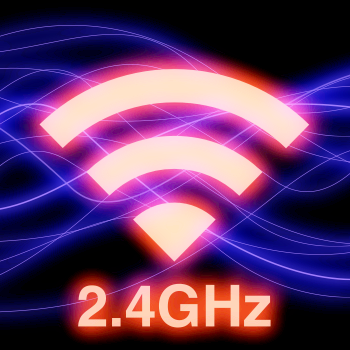 We tried to connect to our 2.4GHz network with our Macs, iPhones and iPads and, while on some occasions we could connect, most of the time it would fail. Really often the 2.4GHz network simply wouldn’t show up at all. I should mention, if you haven’t been playing along with our home game, that with the Airport Extreme routers you can create separate networks by simply naming your 5GHz band something different, and that’s what we’ve done here. I started looking askance at my Airport Extreme as the culprit here. We tried soft resets, and unplugged power to reset, and used the little paperclip hole to reset it as well. Side note: it used to bother me that I kept using new paperclips to bend to do this and I felt like I was wasting them…and then I realized that in the last couple of years I haven’t used a paperclip for anything BUT resetting electronics! Plus the kittens like to play with them on my desk. Anyway, back to our fun with networks story. The Airport Extreme will allow you to export your configuration settings and then import them back in. I knew I could do a full factory reset and get right back to where I was on my network with this technique. Being a belt and suspenders kind of geek, I also whipped open Clarify and took screenshots of every network configuration, and printed it to PDF. I reset the router, pulled in the old settings…and the 2.4 GHz band was still borked. My suspicion was that the 2.4GHz radio was on its last legs, but that the 5GHz radio was still working. One of my new hobbies is getting my money’s worth out of AppleCare, and being retired means I can spend literally hours entertaining the people who answer the phone. My first contact was my new little friend Jayda, and she was delightful. Since I had my lovely PDF I could show her when she screenshared to my computer, she was able to verify everything was set just as it should be. The only idea she had was that maybe I should change the IPV6 settings to Link Local Only (which I’ve heard Dave Hamilton of the Mac G eek Gab mention quite a few times.) Sadly it didn’t help. I asked whether my Airport Extreme was covered under AppleCare, and she told me something I had thought was just an urban legend. She said if within 2 years of when I bought the Airport Extreme, I bought ANY Mac with AppleCare, then the Airport Extreme would be covered under that AppleCare. I just happened to have bought my MacBook Pro and my MacBook inside that window so I was golden. Remember that the next time you’re debating whether AppleCare is worth it on your Macs! Jayda wasn’t sure I could get a replacement sent to me (instead of me driving to the Apple retail store), so she bumped me up to a senior advisor: my new little best friend Daniel. Daniel was great, he understood everything I had done as I’d explained to Jayda, and he authorized a new Airport Extreme to be sent to me. The good thing about getting to a senior advisor at Apple is that they automatically give you their contact information. You can call them, email them, it’s awesome. I got the new Airport Extreme in 2 days…and it had the same problem. Now what are the chances that the 2.4GHz radio would be out on BOTH routers? Yeah, pretty close to zero. Dorothy and I love to noodle tech problems when we’re at the gym because it makes the time fly by. A woman next to us told us once that she loves to listen to us even though she hasn’t a clue what we’re talking about! Anyway, I noodled this with Dorothy and we walked through what was the latest thing to be added to the environment. The only thing that I’d introduced recently was the new powered USB hub I told you about from Anker. When I got home I asked Steve about it (he’s the electrical engineer, I’m only mechanical) and he didn’t think it could be the cause. He explained that the only possible path was the power for the hub, but since that’s coming in at 60Hz, it couldn’t possibly mess with 2.4GHz. Even if it were a harmonic frequency, the amplitude would have died off too much at that many orders of magnitude. Before I got back on the phone with Daniel, I sent him a whole slew of information. I sent him a diagnostics report that I ran from the Airport Utility, I sent him a list of devices that are on my 5GHz and 2.4GHz networks, and I sent him a link to the explanation on how I bypass the Verizon FiOS router and use the Airport Extreme for DHCP and WiFi. I loved working with Daniel because he was methodical, logical, and changed one thing at a time. He explained right at the beginning that eliminating the devices that are on the 2.4GHz band could lead us to find the culprit. He suggested that I unplug them one at a time and we’d watch the effect on the network. He first told me the story of a guy who’s HP wireless printer had been the cause of all his grief. I realized that I totally forgot that my HP printer is wireless and could EASILY have been the giver of grief. I shut it off and sadly it didn’t help. In succession I unplugged the Wemos the control our hot water pump and front light. I unplugged both of the Ring Doorbell chimes. I unscrewed both Hue Lightbulbs. I unplugged the FireTV just in case, too lazy to remember if it was on 2.4 or 5GHz. I unplugged my cordless phone (I had actually thought of this one earlier). I unplugged the Hue Light hub from the network. Nothing fixed the problem. Now think about how patient Daniel had to be here – every single time I unplugged something, I had to change networks, which meant it would kill his screensharing session with me and he’d have to reconnect. But he soldiered on. I started looking around for other things to disconnect. I heard Dave talking on the Mac Geek Gab just this week about how with Wifi calling now, if you have been using a Microcell you can toss it out the window. Unplugged it! And of course lost the call to Daniel! Oops. I got Wifi calling turned on and we were back in business. And yet, we still couldn’t figure out what was causing the 2.4GHz dropouts. Daniel loves his anecdotes, and he said to me, “I don’t look in the refrigerator FIRST for my glasses, but if I’ve looked everywhere else, I have to look there. And once they WERE in the fridge!” His anecdote was his way of convincing me that I should shut off my MacBook Pro from which we’ve been doing all of the testing! As he talked me into it, he suggested maybe it was the measurement instrument itself that was causing the problem. I was doubtful, but I liked his glasses in the fridge analogy, so I shut down my Mac. And the 2.4GHz band jumped right up and started working. Seriously. We were both kinda sad about that though because that meant he had to open a whole new ticket for me because it looked like my Mac had some sort of crazy electromagnetic signal it was producing. He had me do a PRAM reset (aka NVRAM reset) and then boot into Recovery Mode by holding down Command-R on boot up. I have done this a lot of times and didn’t ever notice that you could actually launch Safari within Recovery so we could eliminate all software from being at the root. I tried to connect to the 2.4GHz band…and it failed. And then I had another thought. I suggested maybe it’s not the Mac itself, but maybe something plugged into the Mac is at the heart of this. I unplugged the mini-display port video connection to my Apple Cinema Display first, no change. I unplugged USB from the Mac to the Apple Cinema Display (that lets the monitor act as a hub.) No change. I unplugged the Ethernet to Thunderbolt adapter, no change. The only thing left connected to my MacBook Pro was the powered USB hub I mentioned earlier. I unplugged it…and boom, 2.4GHz came back! Yay – that means it’s NOT the MacBook Pro itself! But we can’t condemn the hub yet, because there’s a bunch of stuff plugged into THAT, right? I disconnected every device from the hub, and plugged just the hub back into my Mac. 2.4GHz was alive and well. Plugged my USB mic interface from Shure into the hub, and 2.4GHz died. Well that’s not the worst news, got it for Christmas, so it’s probably still under warranty. I unplugged it and plugged it back in to be sure…and 2.4 kept working! Argh! For the life of me I couldn’t get 2.4 to fail with that USB Interface again. Ok, fine. I’ll start plugging more stuff in. Everything worked until I got to my 3TB Seagate backup drive…and 2.4 failed again. Well THAT’S good news too – disks are cheap! But then I unplugged the backup drive and 2.4 didn’t come back. What the heck is the pattern here??? Steve and I experimented back and forth and found seemingly random effects. At one point it occurred to me that I normally shove the hub under my monitor and back up against a bunch of other equipment. We tried shoving it under, and 2.4 went away. Pulled it back out, 2.4 came back! Shoved it back under…and 2.4 stayed alive. Oh come ON! At one point the power cable fell out of the Anker hub, which confused all of our experiments. When I plugged it back in, I noticed a little spark. The only explanation we have for this entire story is that there must be some weird power fluctuation or intermittent power connection in the hub that happens to be interfering with the 2.4GHz band. I’ll be chatting with Anker soon to get an exchange because if nothing else, the hub is always in the plot when the network goes bad. I don’t mean any of this as a slam against Anker, by the way. I’m sure that they’ll come through as a quality company that will work with me on this. I hope you enjoyed this story. Steve and I are really happy that after weeks of diagnostics by two engineers, a first level support tech and a senior advisor, we tracked down the root of this pesky problem! Steve was worried I’d throw him under the bus in the telling of this story because I had asked about the hub earlier, but since we still don’t know how it could be doing this I’m going to be nice. What a crazy tale of troubleshooting! My favourite line has to be “Dorothy and I love to noodle tech problems when we’re at the gym because it makes the time fly by.” You’re too fun, Allison! Great story and lesson on proper troubleshooting techniques. Never change more than one thing at a time. This applies to electronics, programming, car troubles and most everything. Please keep us up to date on this. Looking on Amazon.com, the description of every Anker USB 3.0 Hub has a disclaimer about using 2.4Ghz devices with USB 3.0. If you look in the comments, at least some purchasers of almost every model have had difficulty with 2.4Ghz wifi. You may have better luck with a different brand of hub, but they may all have the same problem. Perhaps using an extension cable and changing the location of the hub might help? Very interesting Drew. I see a disclaimer on the one I bought but it talks about Bluetooth keyboards and mice not liking to be near USB 3. I didn’t see anything that said your entire 2.4GHz network will go down! This morning I put the hub on the opposite side of my MacBook Pro and dragged the cable to the far left, and moved the Airport Extreme to the far right. now they’re around 3 feet apart instead of 8″. so far 2.8GHz has stayed up. Thanks so much for this story. It does make sense that a hub could fail considering the complex electronics running through them and how precariously close every circuit is sitting. I’ve been on a Kickstarter for a USB-C hub for the 2015 MacBook. This Kickstarter has been delayed for months. I’ve gotten to the point that I don’t expect to ever receive anything due to the engineering challenges they describe. In the updates, I’ve come to realize that these little mass produced items are really much more complex that I imagined. I could see how just jostling one could have an impact on the wiring. On a similar note, I have a lot of old coax cable running through my house which I use for TV and a MOCHA (multimedia over COAX) network. I’ve come to realize that when I have a problem somewhere in the house, the most likely suspect is a splitter. These units have an “end of life” which is after several years. After listening to your podcast I got my Apple Airport Extreme which was in storage and used it to replace a DLink modem which had been provided by my cable company. Unfortunately, it was an older version of the Airport Extreme and only allows me to choose between 2.4 or 5GHz. instead of having both of them run simultaneously.The good news is that I am getting much stronger wireless signals. Thanks for all the information you provide in your podcasts. I guess it is probably time to get a new router. I had the same issue last year. 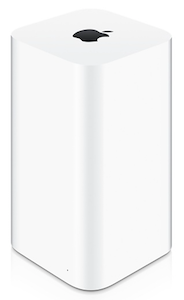 Apple replaced Airport Time Capsule once. It just happened again today. I have 2 Cable Matters hard drive docking stations connected with USB 3 interface to iMac. After reading your story, I decided turning them off and now I can see 2.4GHz networks. I now remember that I moved around the docking stations yesterday. Maybe, I need to change the location for the docking stations. Thanks Allison! I searched long and hard for a quality USB 3 hub and was delighted to find the Plugable 7-Port USB 3.0 SuperSpeed Charging Hub 60W. It even has a power button on the back so I can turn off all connected external hard drives when undocking my MacBook Pro. This article just saved me from factory resetting all my devices!! Although I already did that to some. For some reason, I noticed all my 2.4ghz dependent devices not working, while my 5ghz were fine. THANK YOU for confirming this, Tomorrow I’ll be relocating met apple extreme far away from my computer and 3.0 hubs! This article saved me also. I relocated all my equipment to a different room, with a much more consolidated arrangement. Sure enough, I had a hard drive dock and a separate USB 3 hub that were causing interference. Who knew? Thanks very much to OP and all the following respondents. Thank you for writing the article! I was on the phone with Verizon tech support for hours and could not find the reason for the 2.4 ghz wireless access point disconnect. Verizon arranged to send a replacement router to rule out a hardware issue. Before it even arrived, I was able to regenerate the anomaly by shutting down my macbook. In the end, it was my newly purchased external hard drive that was the culprit. Here’s the model that I purchased: Seagate Backup Plus Hub for Mac 4TB External Desktop Hard Drive (STEM4000400). So glad it helped, Ace!